Your rights at work: The boss can take your tips! KJIPUKTUK (Halifax) – New Year’s Eve may be a distant memory but it was arguably the best night for getting big tips – if you worked in a restaurant, bar or club. But beware: more than 33% of respondents to a tipping study I did a few years ago report either that management takes a portion of their tips, or that the servers do not know if management takes money from the tips. This is because some managers typically collect the tips at the end of the night and then distribute them how they please. Can they take ‘our’ money, is that legal, you ask? Across Canada there are only two provinces in which the Labour Standards Act recognizes that servers’ tips are the exclusive property of the servers. One province is Québec, the other is Newfoundland and Labrador. Elsewhere, across the country—and here in Nova Scotia — bar and restaurant owners or managers can do what they like with the tips. 59% of Halifax bar and restaurant workers in the tipping study said that they collected all their tips. 16% reported that management collected and divided the tips. 17% noted they were not sure what happened to all the tip money, but servers thought it was likely that their manager took a cut. 6% of respondents admitted they weren’t allowed to keep the tips at all. When asked, 67% of the respondents admitted it would be great to change Labour Standards to the way it is in Québec or Newfoundland and Labrador. In other words, tips should be the property of the server. 17% of respondents said there was no need to change the law. Of course none of this speaks to the tip-out to the front and the back of the house staff. The tip-out is for staff who don’t usually receive tips directly from the customers. 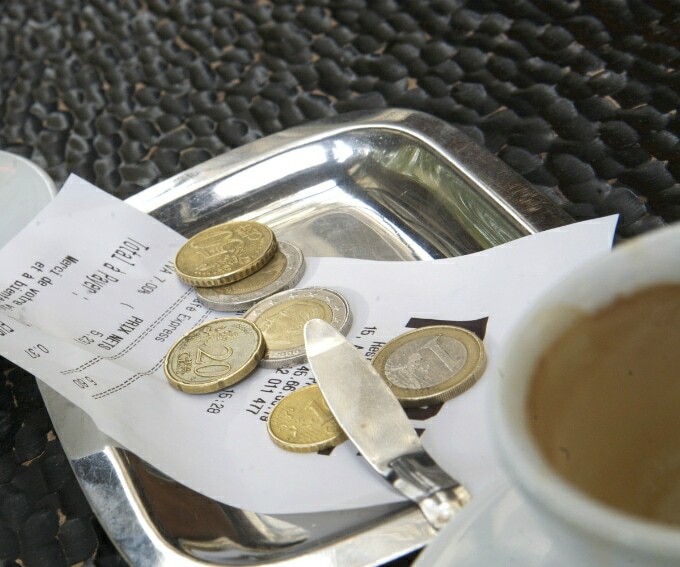 The servers often pay a percentage of their tips to the host or hostess, the buss-people, and the kitchen staff. However, many restaurants and bars in Halifax in fact charge servers just to work there! Here’s how: every shift, servers must pay 3-5% of their total food and beverage sales to management. On $1000 sales in food and beverage, the server pays from $30 – $50 to “the house”—whether or not they made tips on all the sales that shift. Then there is the ‘dine and dash’ fund. Some restaurants collect .50-$1.00 from servers each shift. That money is meant to cover customers who leave without paying their bill. Or the fund is used to cover breakage or theft of glassware or cutlery. Imagine how that adds up –if a server works 5 shifts a week, 40 weeks a year—management can take $100 a year off each server’s pay. And if there are 10 servers—it works out to at least $1,000 plus a year that management is able to steal from its workers. Is this against the law? In Nova Scotia, yes and no! If the employer charges a server when a customer leaves without paying, the employer has to be able to show that it was the server’s fault the customer did not pay. Only then is the boss entitled to charge the server. However the is seldom enforced: most restaurant owners or managers simply dock the server whose customers did not pay. Or they charge every server 50 cents or a dollar per shift – which is nothing but a cash grab by the boss. It is a blanket penalty on all servers even though there is no proof any server was guilty of allowing customers to dine and dash. As for charging for breakage, the Nova Scotia Labour Standards Act suggests the manager obtain a written authorization or a “clear agreement between the employer and employee” when they start the job about deductions from employees’ pay. Of course almost no restaurant or bar bosses clarify these ‘rules’ with their staff. An ironic twist is that NS Labour Standards states that any deductions an employer does take from an employee’s gross pay must not take the wages below the hourly minimum wage! And finally a note to restaurant patrons. It does not matter if you leave a cash tip or one on your debit or credit card. The same things happen. If the boss takes part of the tip, he will take part of the tip whether left in cash on the table or on a card. If the server has to pay 3-5% of sales each night for the “privilege” of working there, that’s how the boss collects his tip. Judy Haiven is a retired Professor of Industrial Relations at Saint Mary’s University. She is also co-chair of the Canadian Centre for Policy Alternatives – Nova Scotia. Does it do any good for a customer to ask, at a given restaurant, how tips are managed there? I routinely tip at 20% on top of tax, in the assumption that it goes to the servers. I’m not interested in having it funneled into the proprietor’s pocket (unless it’s a mom-&-pop joint where server & owner are one & the same). I would prefer to boycott any place that rips off the tips. Majority of the chains I have worked for or know friends that work at them take 3-5% of food sales to give to the kitchen staff as a gratuity, 3-5% of bar sales to the bar. However, the entire 3-5% of food sales does not go to the kitchen as they receive 1$ extra an hour. The average amount of staff on a night shift is 7 people. Their average shift is 6 hours. So each night that’s about 42$. But each server can tip out anywhere from 20-50$ a night. With an average of 5 servers… so there’s some major discrepancies. I know a locally owned restaurant that upped the servers mandatory tip out from 2% to 4% because the owner didn’t want to pay the kitchen staff a raise out of his pocket. Thanks for publishing this! As a restaurant owner its good to get a snap shot of what other activities are going on in my market. Tipping policies are very much a “wild west” scenario but you paint a picture that is arbitrary and full of distrust (if not hostility) between owners and staff. Yet another “baked in” issue in hospitality. For my part (and we only have 3 staff at the moment, so I am lucky in that regard), I pay out all tips as part of payroll, administered by a third party accountant. My staff can contact him directly if they have any concerns (and he’s been instructed to be open about information regarding their pay). Additionally they all have access to the POS that displays what grats they earned in a shift. True, this means tax is applied to this income but it is transparent. I/we claw nothing back for the house. The practice of tip pooling and/or paying out other staff is a really tricky one (one I am glad I don’t have to deal with, tbh). The just model is really dependant on the style of restaurant you are operating. If you are in a classical “white linen” fine dining environment the service expectations generally require more than one pair of hands for the table. Busers, runners, stewards of any kind should certainly be cut in. In more modern Quick Service environments, especially with open kitchens where the distinction of FOH and BOH gets blurred, pooling seems to be the fairest solution. Tipping out the kitchen, well, I am too biased to say much in a short space. I will say feelings of inequity over tipping is one certainl y one of the prime stressers between FOH and BOH and as such one of the lead causes of friction and poor team work. If, as suggested here, labour law is slight in its ability to redress some the problems over tipping, could a potential solution be found in tax law? My understanding is that management can face serious (and personal, not sheilded by the business) tax implications by dipping into tip pools? That might be a scorched earth solution, but at least it could be a stick of any sort for the employee to use…. I have worked for many places…Most places take 4 % to 6% of your food and bar sales. The restaurant generally makes more tip out than the server. It is highway robbery. Serving alcohol in NS if theft, especially when the place does not have a bartender, and the server makes all the drinks, pours the drafts, serves it, and then has to pay 4% of the sales. I worked at a place that I served and they had takeout..well take out customers generally do not tip, but the restaurant still would take 4% of all my sales, including the dining room…Half the time I would leave with almost no tip. Really the Nova Scotia Gov. needs to get a grip on this, because the owners are walking away with tips they don’t pay tax on, and just goes in their pocket. It makes me sick… I love working in the industry, you work hard, meet lots a super customers..but robbing a server, that the customers tip for good service is not right. Bottom line.